Upon entering this field, you find yourself on the deck of an abandoned ship, built with a technology that is currently beyond mortal comprehension. It is said the gods once traveled in it to a banquet held on the earth, but it was left in this cave after a great commotion ruined the banquet. A sort of barrier seals the cavern entrance from outsiders and the only way to enter the cave is by logging in through the chaos gate. The rooms and passageways inside the ship are so impossibly numerous and spacious that you wonder if there is an entire different realm within the ship. Creatures who have lost the favor of heaven have taken refuge inside. The Orbital Sphere that had spirited Aster away from the streets of Mac Anu quickly phased into sight on a corner of the ship's deck. Blinking for a few moments as his eyesight adjusted to the new lighting, he quickly scanned the area for the Chaos Gate. Once he found it, he set off in that direction. He was expecting the player, Mouse, to join him in this latest leg of his mysterious journey. While the two had been enjoying a day in the server's Root Town, he'd overheard some players discussing a shining red jewel. The circumstances around the conversation were strange enough to leave no doubt that they were referring to a memory sphere. That item had been found here, in the possession of a strange child no less. Silver, I imagine. He shuddered at the thought of what that boy could be up to, and once again he questioned whether he should've invited his new friend here. "She said it'd be fine..." Aster muttered, and it took him a while to realize he'd even voiced the thought. With a sigh, the Vagrant crossed his arms and his standing pose loosened. He was going to focus on the task at hand, not his anxieties, and trust in the connection he and Mouse had made. With that in mind, he waited. Mouse appeared at the entrance to the field much more quickly than Aster had expected. Had she ran straight from the spot he left her to the Chaos Gate? The thought brought an amused smile to the Cleric's face. As she commented on the ambiance of the field, Aster slowly moved his gaze to follow hers toward the cave mouth. "It could certainly be worse." Though the field was stunning, he didn't feel he could properly appreciate it while his task loomed. The Runechemist put Aster's mind further at ease when she affirmed that, not only would they succeed, but more importantly that she would heed his words as they went. "Thank you, Mouse," he offered genuinely as he manipulated the necessary data to invite the girl to join his party. The AI began to wander the deck as he detailed the item they were seeking. "What we're looking for is really quite simple, though it may not be the easiest thing to spot. It's a small, shining red orb." He paused for a moment, considering his next move. Shrugging inwardly, he elected to retrieve one of the two memory spheres he already had as a reference. "It will look just like this." As he finished, he hurriedly placed the item back in his inventory. He had acquired two of these strange items, and both had been shrouded in darkness both outside and in. Aster briefly recounted the two visions they had shown him, one of happy siblings in The World...and another of a boy in a hospital at his wit's end. The Cleric closed his eyes, wincing slightly. What visceral memories they had been. He shook his head, dispelling the thoughts. This situation demanded his full attention. He began scanning the area for an entrance to the ship interior. "At the very least, I don't think it's out here...ah." Finding an opening in the ship with what appeared to be stairs leading downward, his pace quickened in that direction. "In we go," he chimed, mustering as much whimsy in his voice as he could. It was a terrible effort, but he tried. 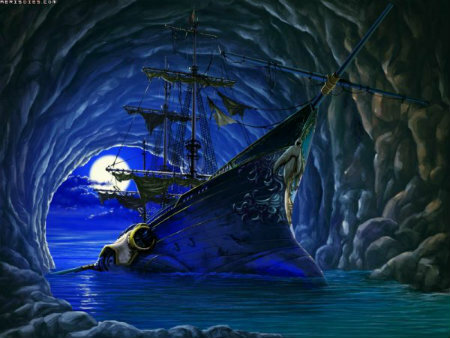 As the pair began their adventure within the ship, icy blue eyes stared at them from a hidden nook of the cave. "He's here. Well, he certainly isn't wasting any time." Silver couldn't help but notice, of course, that Aster wasn't alone either. Did the players of The World know anything other than incessant meddling? The boy's eyes grew distant as the question settled. If it wasn't for the meddling of players...but then again... "Hm." The boy closed his eyes and focused. After a moment his AI ability, Data Chains, flared to life and sealed the only entrance/exit to the field. "Let's see what happens next. Clara, Sage." Aster noticed the shift in the field's access levels. It only came to him as a sensation, but this was one he had felt many times in his quest. He wondered if Mouse would somehow be able to tell they had been locked in, too. Well, "locked" in. He had the power to affect fields like that as well. While he wasn't sure he could override the existing data entirely, he'd be damned if he didn't punch a wall through it for Mouse to escape if necessary. Worrying instead about the path ahead, Aster observed the ship's interior now that they had reached the bottom of the stairs. It's appearance was similar to a long-dead cruise ship, with faded art pieces tucked everywhere and tattered fabrics lining the floor. A hallway spanned in front of the two and it was clear that it branched off about a hundred feet down. Not only that, but many, many doors lined the path to the split. "This place is huge," Aster mused softly, continuing forward as he spoke. "We'll be here forever if we search blindly. Though I have no idea how to close in on the item we're seeking." His instincts had lent a hand before when looking for the spheres, but that pretty much happened on their time. He couldn't force that instinct awake. For now, he figured, their only choice was to wander a bit. "Any of these doors jump out at you, Mouse?" He knew he probably wasn't keeping up his end of the social banter, but he hoped she would understand. Every hair on his digital body was on end, and he hated it. "Looks like the hallway splits further down, too. We could check that out." Of course, they would make their way to it eventually even if they stopped in rooms along the way. "We need to familiarize ourselves with this place somehow..."
The Cleric had chosen to remain silent during Mouse's reaction to the sealing of the field. Anyone could see she was impacted by...something at the same moment he'd sensed the change. Still, something told him not to ask her about it. At least, not now. There was time for that later. Once his friend has regained her composure, she chimed in with her two cents on their next move. Aster nodded his head in agreement when she guessed their objective was probably further than the front door. It wasn't like they couldn't double back if needed. At least, theoretically. "You're right that important objectives would lie further in," Logic didn't strictly apply to the location of the memory spheres, but they had to start somewhere. "Let's be sure we know how to get back as we go," he added as he moved down the hall. Before long they had reached the end of the linear part of the hall. The path split from there into four: a hallway 90 degrees in either direction and two that proceeded forward and banked slightly to the left and right. "A lot of options. I guess we'd better get used to that," he sighed. Perhaps the intention here was to split up. Well, that intention could buzz off. As long as the two were here and unable to leave, he wouldn't part with Mouse. "If we're sticking to the idea of moving toward the back, the paths ahead would be our bet. Naturally, there couldn't just be one..." Aster gazed down each of the halls, but none betrayed any differences. "The side paths might be it too, though. And I imagine we would reach their end sooner." The length of the ship spanned so large they hadn't been able to identify it, but during their time on deck the width of the ship had been plain. Aster closed his eyes and focused, trying desperately to sense anything that would nod him in one direction or another. For now, nothing. He had the feeling he needed to know a bit more about the field first. It was maddening, knowing his abilities as an AI correlated to his feelings and instincts rather than explicit processes. No amount of complaining would fix it, though. "Thoughts?" A relaxed smile appeared on Aster's face as Mouse made her suggestion. There was something about her that was warm enough to melt an Ice Age. He thanked whatever whim had brought them together before this chapter of his tale. The Cleric nodded his agreement at his comrade's idea. They had to start by...starting. With no information to nudge them in a direction, it was their only option. "That plan sounds fine to me," he declared, doing his best to put a little backbone into his words. Now was the time to prepare. "I'll follow your lead then. Whichever you think is best. No wrong answers." Mouse quickly made her choice and began moving toward the front right path. The forward paths would give them a clearer idea of the ship's layout if nothing else. That was, of course, assuming that each path continued to be as straightforward as they looked now. Aster sighed and shrugged his shoulders. Here went nothing, as always. As the pair moved down the hall, Aster noted how bare the path was. A typical red carpet ran endlessly down the middle of the hallway, but that was about it. There we no doors and nothing decorated the walls or ceiling save for the lanterns that lit the path. After a while of the monotony, the lighting ahead shifted and indicated a new room. Aster picked up the pace slightly, knowing he wanted to greet whatever was ahead first. Not the best move for a healer, but it certainly wouldn't be the first time he disregarded that. The room in question was a rather spacious lounge. Dozens of tables and sofas were scattered across the room, while an almost comically long bar occupied the far right corner. Aster's eyes immediately drifted to the wood that composed most of the decor. It appeared to be redwood, and the material had a peculiar luster to it that he simply couldn't explain. At the far end of the room he could see a door forward, but... "Wait." It had taken him another moment to discern the monsters, if that was what they were. Three puddles of black sludge, each the size of a ship's wheel, slithered across the floor of the room. Something told him they would assume different shapes if engaged. "Well...what do you think?" he asked his partner, assuming she had gotten a decent look at the room by now too. "We could strike the enemy first...or try to move around them." He didn't see any point in engaging the monsters, but it had been a while since he'd seen any combat. Somehow he felt they would find a clue no matter what they did. Aster could tell there was something else lingering in Mouse's mind on this adventure. She'd made it abundantly clear that she was here to help him, above all else, and it was certainly a great comfort. Yet he sensed some other will in the mix, and a turbulent one at that. If it stemmed from Mouse, why? Was she confused by his peculiar nature and mission? Was she scared of the ship, or of the circumstances that had brought them to it? Or...was it something stranger? Whatever the case, he wasn't about to bring it up now. His comrade had a story of her own, and whatever it was it was her's to share when she pleased. He trusted Mouse to let him know if anything troubling her became urgent. And if that didn't happen (which was more than fine by him, of course) perhaps he could inquire later on. But for now, they had a room to maneuver. The Vagrant smiled with satisfaction when he heard Mouse's plan. "Clever. I think that would probably work," he praised, trying to reciprocate a bit of the positive energy he was receiving. Aster pondered how to go about striking something at the bar. They didn't want to get too close, and yet... "Hitting it with magic would probably be too much. Hm..." An admittedly simple idea popped into his head and he scanned the room. Soon his eyes settled upon a small vase sitting on a nearby endtable. "I don't really know if this will do it, but here goes." In a fluid motion the Cleric grabbed the vase, twirled it briefly in his hand, and threw it toward his target. The object reached its destination and the glass shattered against the back of the bar, knocking over a couple of bottles. Vibrating with agitation, the puddles of sludge began creeping toward the sound. Without really realizing it, Aster whooped his fist in victory. "All right. Let's search for the sphere quickly." He paused a moment, thinking, before equipping his translucent crimson wings. They were somewhat flashy, but he was going to place his bet on minimizing sounds rather than sights. The Cleric began drifting about the room in as stealthy a way as he could figure. His eyes flickered between the various redwood furnishings, knowing there was something to be seen here. He wondered if Mouse was having any luck. If anything in the room seemed strange to her, he hoped she'd make note of it. 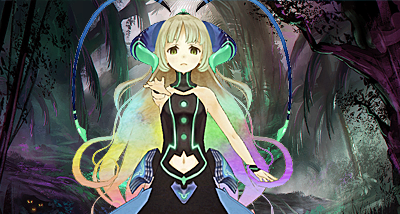 Lily Ayame is experiencing a migraine in the real world due to Cernunnos' attempt to assume control over Mouse. It was becoming clear that they would never be able to scan the entire area before the monsters returned to their positions. Aster searched every corner his eyes could catch, but nothing stood out. His issue, of course, was that he was looking around the ground. Luckily, Mouse had managed to spot exactly what they were looking for. Above the bar hung a painting with an obvious graphical scar. Aster immediately recognized it, as he had encountered such scarring many times on his quest. Moving quickly, he began to focus his energy on analyzing the painting's data. "Just hold on for a moment. I think I can--"
He detected a trace of something terrible. And it was coming from Mouse. But that couldn't be right. "Are...are you okay?" he asked, wholly forgetting about the time crunch they'd been on. What in the world had he just felt...? His thoughts were cut short when the monsters re-appeared. It seemed they'd had even less time than anticipated, and what time they did have he had wasted. "Tch. Here they come!" The three puddles of sludge closed in on the pair before, strangely, grouping together and shifting into a large puddle. The shape immediately began to writhe and shift, changing into the silhouette of a looming 11-foot-tall knight. It wasn't what Aster had expected. While the knight definitely seemed tough, though, taking out one target seemed easier than three no matter what. The Cleric ceased his staring and withdrew his staff, Atrophy, with a short twirling flourish. In the next moment... "Lei Zas!" The jewel in his weapon began to glow with searing light before discharging a powerful bolt toward the creature. The attack connected cleanly and broke the knight's stance as it stumbled backwards. Immediately, the monster let loose a shrill warbled shriek and a massive claymore appeared in its hands. 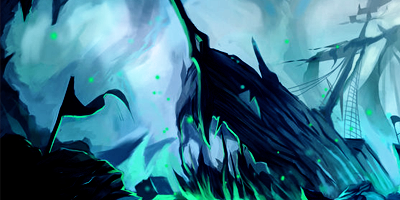 It stared at Aster for a moment, its entire visage seething with anger. "Oops." In the next moment it began charging toward him, and Aster immediately ran off to re-position. His mind was whirling with a hundred thoughts, but right now he just needed the one involving his next move.